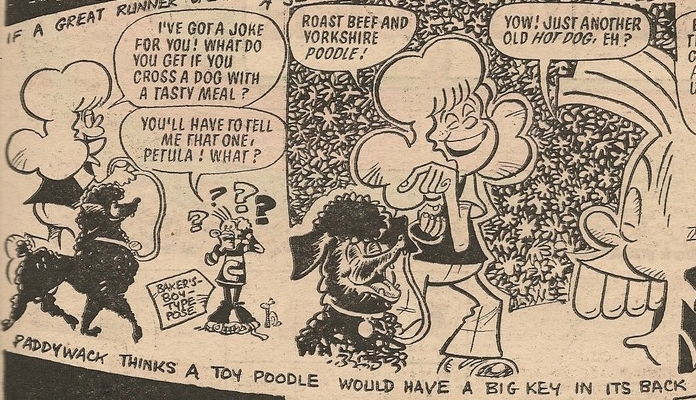 The toothy funster's jolly journalist chum Rex Press made his debut in Cheeky Weekly dated 29 September 1979. Or did he? 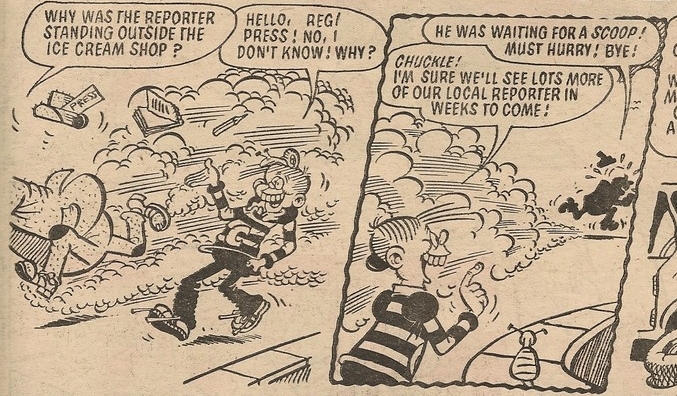 I suspect that the newspaper reporter named Reg Press who made a single Cheeky Weekly appearance in the issue dated 15 September 1979 was intended to be the same person, but maybe an admin mix-up resulted in his name being changed. 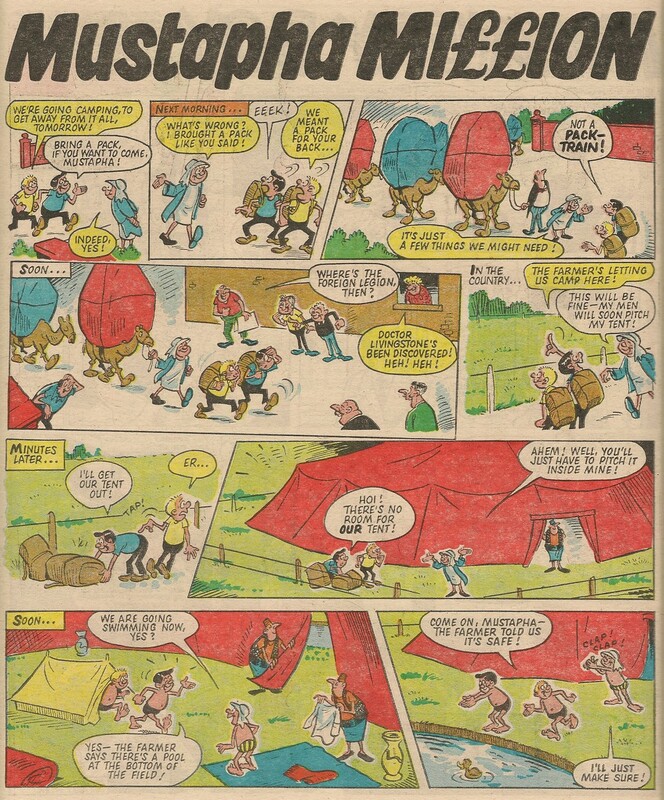 Rex is obviously a more appropriate appellation since, when coupled with the surname (which is itself a nod to machinery crucial to the journalistic profession), it references newspapers containing Express in the title. 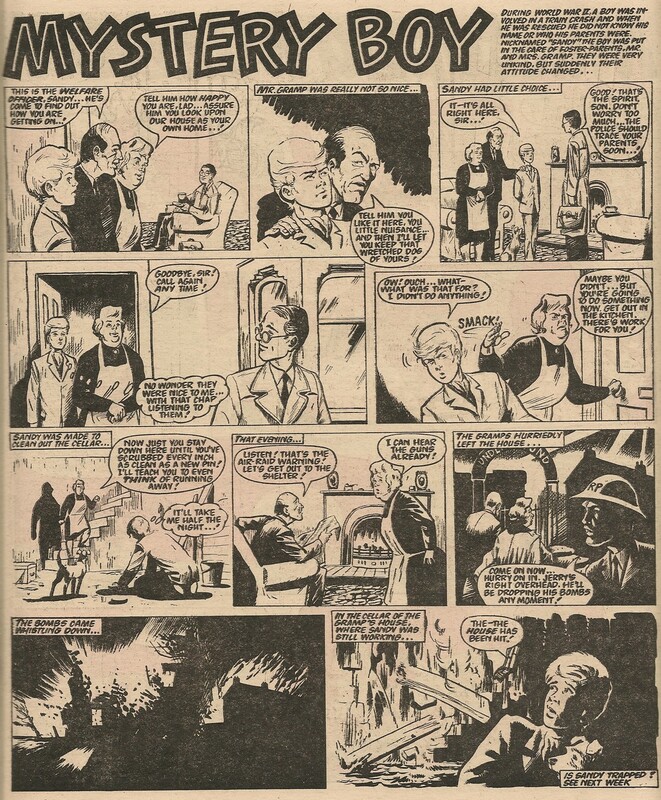 'Reg' was drawn by Jimmy Hansen and the fact that the journalist's face wasn't seen on this occasion makes me wonder whether Frank McDiarmid hadn't designed the visuals for the character at that point. However, by the time that Rex made his debut two weeks later his trademark 'tache, trilby, and check jacket were fully formed. 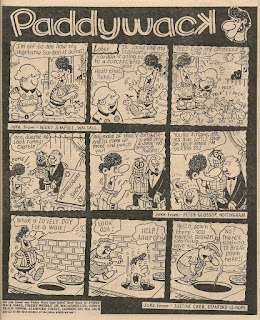 Cheeky's 2-page Saturday strip in the 10 November 1979 issue showed our grinning hero visiting the newspaper office, and Cheeky popped back to Rex's workplace for a quick Tuesday gag in the edition dated 24 November 1979. 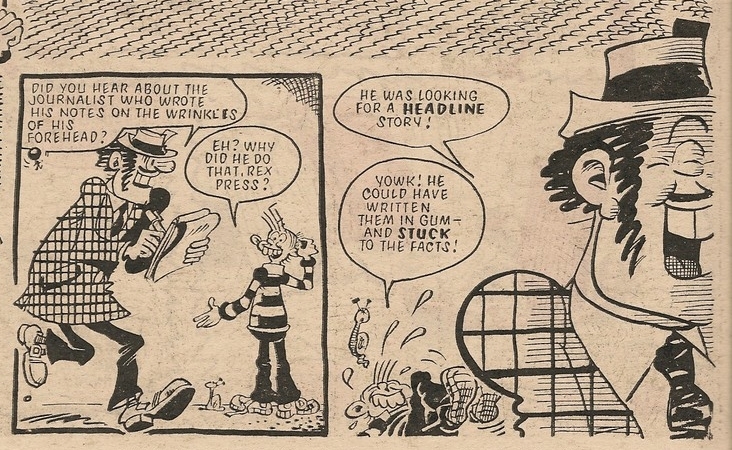 Although he played a major role in the Speed Squad story in Cheeky Weekly dated 15 December 1979, the intrepid trio failed to recognise Krazy Town's roving reporter. Rex Press didn't quite make it into Cheeky Weekly's final issue. 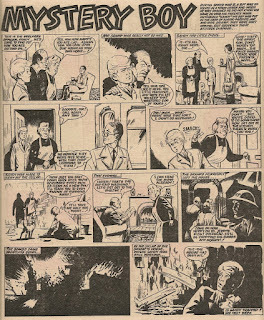 His last appearance was in the penultimate editon, dated 26 January 1980. 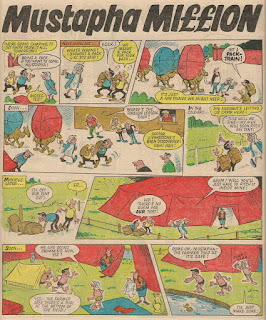 Nevertheless Rex, despite being a rather late entrant into the Cheeky Weekly supporting cast, turned up in a creditable15 issues (16 if we include Reg). Neither Reg nor Rex ever appeared in Cheeky's strips in Krazy. Cheeky Weekly comes under the spotlight again (and why not - I say you can never have too much Cheeky) over at the Great News blog, as the first issue of the toothy funster's own title, cover dated today, 39 years ago, is examined and found to be full of fun. Happy birthday! 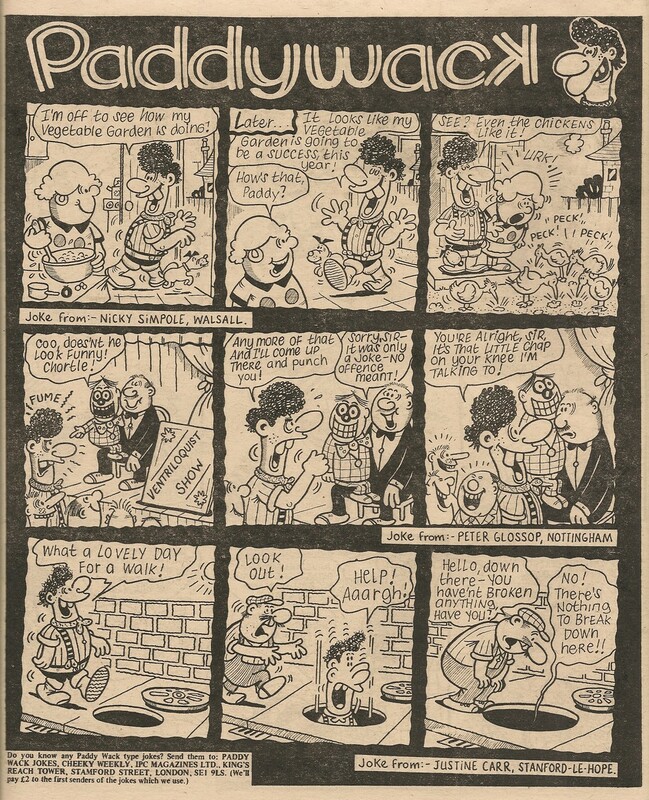 The Great News blog is looking back at the momentous comic that set the Cheeky phenomenon in motion. 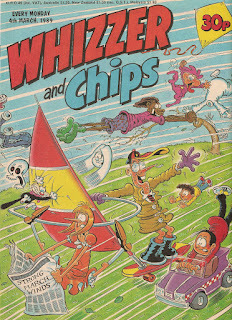 By early 1989 the 'rival comics' aspect of Whizzer and Chips was being de-emphasised, to the extent that all cross-comic raids had ceased, Sid and Shiner's letters pages were both located in Whizzer while their respective comic strips had been combined into single a feature within Chips, and readers were no longer encouraged to separate the two 'titles'. 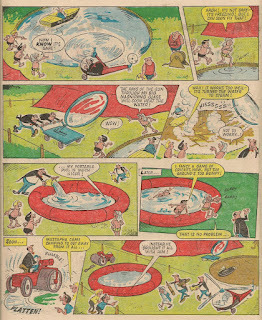 Also gone were the cover comic strips, replaced by a series of full-page depictions of the W&C stars in situations various. As the comic increasingly resorted to reprints, these covers showed resurrected IPC veterans such as Fuss-Pot sharing jolly japes with newcomers including Wonder Wimp. 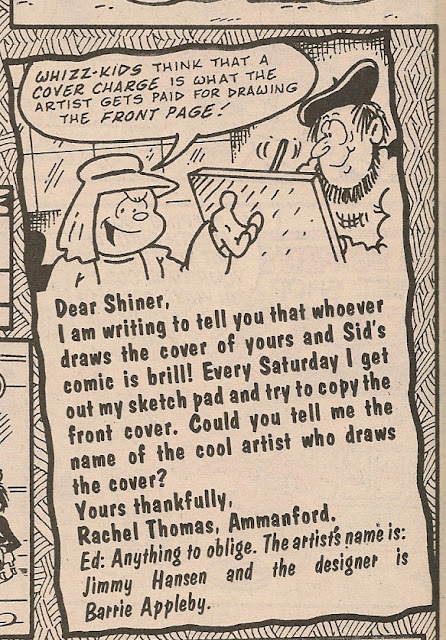 In the 04 March 1989 edition, reader Rachel Thomas asked who was responsible for the cover art. The answer revealed that the covers were a collaborative effort (a surprise to me) between Jimmy Hansen and Barrie Appleby. This week it's the turn of Charlie and Calc to get an above-title banner promotion, below which Gunga Jim is the instigator of maritime mirth. The action takes us to Krazy Town harbour once again, and we even get a glimpse of the lighthouse in the distance. Do snails find the salty coastal atmosphere uncomfortable? Cheeky's slithering pal gives no indication, but appears to be enjoying the gag. Sadly the unnamed pirate character, despite seeming ripe material for a smattering of corny nautical witticisms, never returned to the Cheeky's Week supporting cast. 6 Million Dollar Gran takes a trip to a stock car racing tournament, and it's not long before she pits her own jalopy against another old banger. Needless to say, the aged automaton emerges triumphant, and blows the prize money at a food stall. 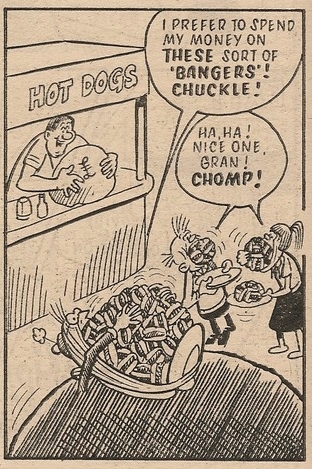 Ian Knox's typically grotesque final panel shows Gran cramming celebratory comestibles into her synthetic alimentary canal. Having a much easier time of it is Mustapha Million, who this week is enjoying a story in colour. With the festive season on the horizon, WH Smith place an ad aimed at those readers busy compiling their Christmas lists, notifying them that this year's annuals (dated a year ahead, as is the tradition) are now in stock. 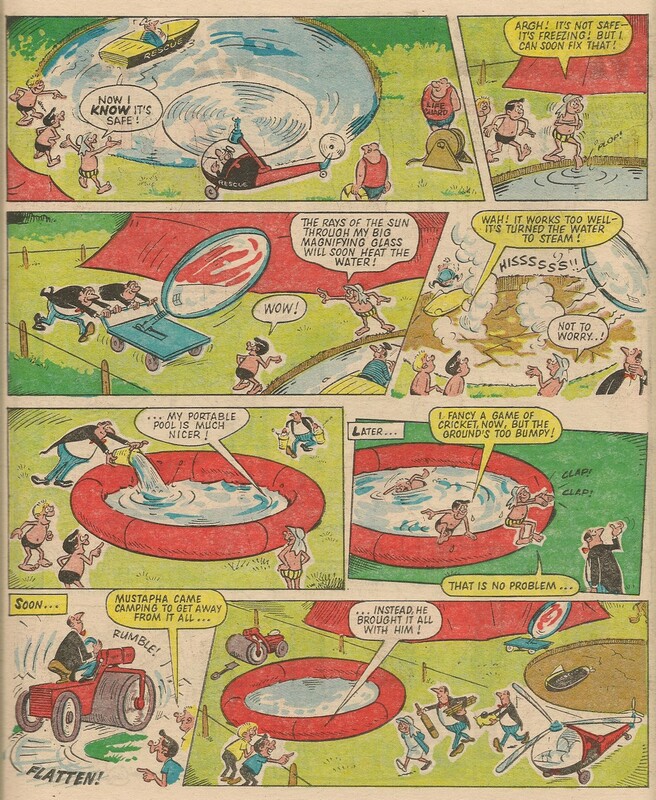 The Beano is prominently featured, and a number of other DC Thomson titles are mentioned, but sadly the 1980 Cheeky Annual doesn't get a promotional boost. However, IPC ran an ad for it in last week's issue. 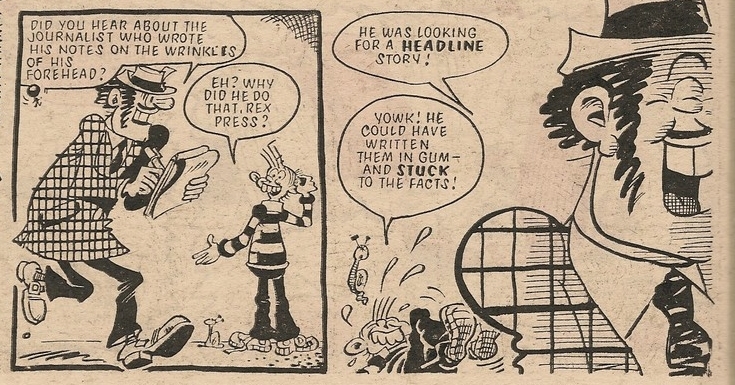 Thursday sees Cheeky's first encounter with humorous hack Rex Press, although it's quite possible that the similar character named Reg Press who appeared in the comic dated 15 September 1979 was intended to be the same person. Paddywack encounters an open aperture – I've always said Manhole Man should take more care. 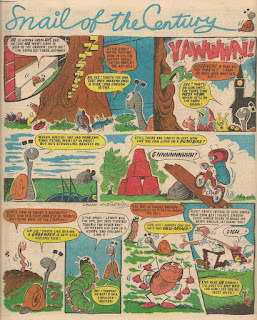 The comic concludes with the garden-goings-on of Snail of the Century, which was absent from last week's issue. 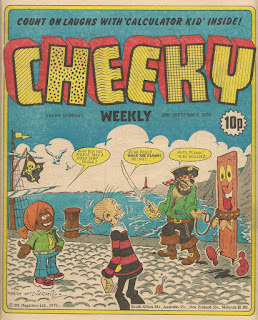 This is a gratifyingly all-Frank McDiarmid-Cheeky's Week issue, the previous such edition being that dated 08 September 1979. 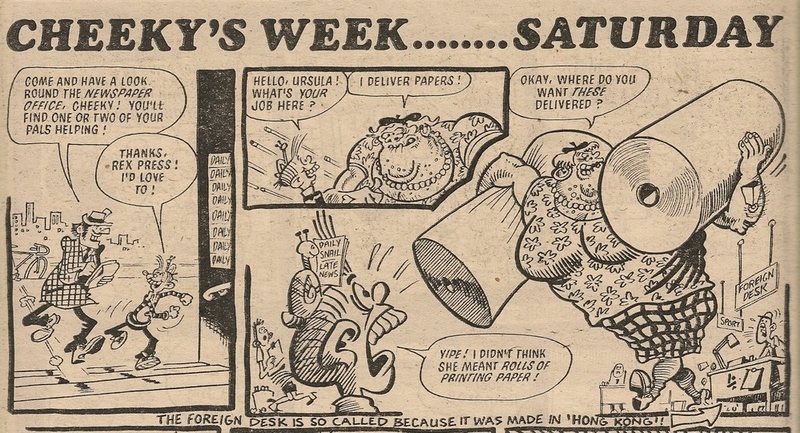 There are more Cheeky goings-on over at GNFAR today, as a pre-Cheeky Weekly issue of Krazy comes under the spotlight. This issue is one of those featuring the teasers that preceded the debut of the toothy funster's own spin-off title.